From Disney's wildly popular The Jungle Book comes a thrilling, all-new animated feature film. The jungle is jumping again as Mowgli, Baloo, Bagheera, and the rest of your favorite characters return in the fun-filled musical adventure The Jungle Book 2. "It's a work of such charm and imagination it should enchant children of all ages" (Kevin Thomas, Los Angeles Times). Mowgli (Haley Joel Osment) has been living in the village among the humans. His new life includes his little stepbrother, Ranjan, and his best friend, Shanti, but the man-cub still has that jungle rhythm in his heart, and he misses his old buddy Baloo (John Goodman). When Mowgli wanders back into the wild for some swingin' fun, he soon finds Baloo isn't the only one waiting for him – the man-eating tiger Shere Khan is lurking in the shadows and planning his revenge. If he is to defeat his nemesis, Mowgli will need the help of both his old friends and his new family. With fresh new renditions of "Bare Necessities" and "I Wanna Be Like You," and a host of original toe-tappin' tunes paired with classic Disney animation, The Jungle Book 2 is sure to delight the entire family. $14.109 million on 2808 screens. Most of the sequels Disney creates for their animated hits go straight to home video, but a select few bowed on the silver screen. With a case like Toy Story 2, the rationale seems obvious. Originally intended for the small screen, that flick simply proved too terrific not to get the bigger opening. 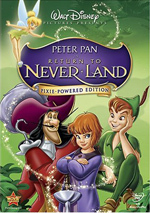 Then we get cases like Return to Neverland. A relentlessly bland and mediocre offering, I can’t for the life of me figure out why Disney felt it merited a theatrical exhibition. Still, it made $48 million, which seems pretty decent for a film with a fairly modest budget. The studio’s next big screen sequel, 2003’s The Jungle Book 2, did almost exactly the same. It took in $47 million and apparently had virtually the same budget. It’s a shame that a good Disney flick like Treasure Planet bled money while dull efforts such as Book 2 turn a profit, but what’re ya gonna do? Book 2 picks up a short period after the end of the original film. Former wild child Mowgli (voiced by Haley Joel Osment) now lives in the “man village” with an adopted family that includes Shanti (Mae Whitman), the pre-teen seductress who lured him out of the jungle in the first place. Mowgli remains drawn to his old life and wants to hang out back there, an activity endorsed by his younger “brother” Ranjan (Connor Funk). Shanti is afraid to go with them, though, and Mowgli regards her as something of a downer. While Mowgli mopes, we re-encounter his old friends and surrogate parents Baloo the bear (John Goodman) and Bagheera the panther (Bob Joles). We see that Baloo still really misses Mowgli, and he tries to sneak into the village to retrieve the boy. Villainous tiger Shere Khan (Tony Jay) remains on the prowl for the kid, as he wants his revenge on Mowgli for actions from the first film. Eventually both Baloo and Khan make it into the village, though obviously with different agendas. The villagers chase away the tiger while Mowgli escapes with Baloo. Since Shanti thinks the boy’s in danger, she follows the pair to “save” him, and Ranjan tags along too. They eventually catch up with Mowgli and the animals, but he doesn’t want to return to the village. The rest of the film examines his relationships with the humans and the animals, and we also watch as the villagers track the kids. The original flick didn’t offer much of a plot, and the sequel doesn’t either. Essentially it just shows the pursuit to find Mowgli and the kids, though it adds some attempts to develop relationships. The first movie felt mostly like an excuse for a lot of production numbers, and the sequel works along the same lines. Unfortunately, the song and dance pieces seem very forgettable. I never much cared for Jungle Book, mostly due to its lack of plot and its scattered focus. However, at least the movie presented characters and tunes with life and spark. Book 2 fails to deliver anything memorable in the music domain, unfortunately. Of course, it repeats the original’s most famous song, “The Bare Necessities”, but none of the other tracks make an impression. I don’t think many will leave a screening of the film with those melodies in their heads. Essentially Book 2 feels like little more than a pale rehash of the first movie. In that one, Baloo and Bagheera quibbled over whether Mowgli should stay in the jungle or go to the village. That debate remains in Book 2, though the additional human characters complicate matters somewhat. Unfortunately, the latter elements don’t create anything engaging, as the movie fails to really invest in the story. None of the original movie’s actors return, largely because most of them have died. (Bruce Reitherman, the original Mowgli, is still with us, but one would hope that his voice is now too deep for him to reprise the role.) The recast performers do fairly well in their roles. They imitate the prior actors well and attempt to bring some life to the parts. None of them excel in the movie, but they cause no problems. The animation of Book 2 falls somewhere between that of Disney’s theatrical animated “classics” and the studio’s direct-to-video work. The art looks good but the animation seems a little stiffer than normal for theatrical releases. At least the motion appears smoother and more realistic than the video programs, though. When considered against those direct-to-video movies, The Jungle Book 2 comes off pretty well. If it’d gone straight to DVD and skipped theaters, it’d rank among the best of the non-theatrical releases. However, it fares poorly among the big screen flicks. Book 2 isn’t a bad film, really, but it seems flat and listless in general and it doesn’t do much to ingratiate itself with the audience. It allows viewers to pass the time in an amiable enough manner, but it won’t stay with them. 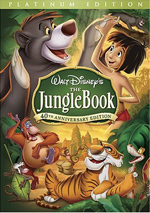 The Jungle Book 2 appears in an aspect ratio of approximately 1.66:1 on this single-sided, double-layered DVD; the image has been enhanced for 16X9 televisions. Disney rarely botches transfers of their animated flicks, and Book 2 provided another good visual experience. Sharpness mostly seemed solid. Some wide shots came across as a smidgen soft at times, but those occasions appeared rare. For the most part, the movie looked concise and detailed. Jagged edges and moiré effects caused no concerns, but some light edge enhancement appeared. Print flaws looked absent, as I detected no examples of specks, grit, or other issues. Given the jungle setting, I expected to see a varied palette, and Book 2 didn’t disappoint. The movie enjoyed some lovely and vivid hues from start to finish. The different characters and settings presented a mix of lush and rich colors that the DVD reproduced impeccably. Black levels also were solid, with dark tones that looked deep and dense. Shadow detail came across as detailed and accurate and never seemed overly thick. Overall, Book 2 consistently looked positive. 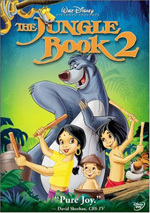 The Jungle Book 2 presented generally positive audio. The DVD included both Dolby Digital 5.1 and DTS 5.1 soundtracks. Based on my comparisons, I detected no substantial differences between the pair. The soundfield maintained an emphasis in the forward channels, but it blended with all the speakers reasonably nicely. In the front, the music showed fine stereo separation, and effects also appeared in their appropriate places and blended smoothly. Those elements came to life well during the movie’s more active scenes, and the movie included nice use of localized dialogue; speech even emerged from the surrounds at times, especially during the puppet show that opened the flick. Otherwise, the rear channels mostly just provided general reinforcement, but they offered good activity when it mattered. For the most part, audio quality seemed fine. Speech sounded natural and distinct, and I noticed no issues related to intelligibility or edginess. Effects were clean and accurate, and they displayed nice depth for the louder sounds. For example, the stomping feet of the elephants demonstrated good punch, and thunder sounded good. Unfortunately, music featured fairly weak low-end response. The songs sounded clear and bright, but they lacked heft and seemed to accentuate high-end too heavily. This was most noticeable during the film’s rhythmic songs, as they failed to deliver much power. Nonetheless, the track remained positive enough to earn a “B”. A smattering of supplements appear on The Jungle Book 2. The Original Movie Recap offers exactly what it implies: a two-minute and 58-second synopsis of The Jungle Book. It won’t do much for those already familiar with the film, but it’s a good way to bring new viewers up to snuff. After this we find two Deleted Scenes. We can watch these with or without introductions by Disney senior vice president for music Matt Walker and executive vice president Sharon Morrill. Taken all together with the intros, the clips run nine minutes and 22 seconds. Both offer unused musical numbers called “I Got You Beat” and “Braver”. Each presents a rough music track with storyboards. Neither seems very entertaining and they were good cuts. Walker and Morrill helpfully tell us why the scenes weren’t used. 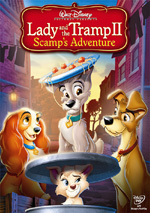 What would a Disney animated DVD be without a game? Here we get Mowgli’s Jungle Ruins Maze Game. This makes you wander a labyrinth and answer some jungle animal related questions. The latter aspect makes the game a little more entertaining than usual, but not much. Mostly you wander through the maze and hope to eventually get out of there. When you do, the “reward” is nothing more than a clip from the movie. Yawn! A basic featurette, The Legacy of The Jungle Book runs 14 minutes and 10 seconds as it presents the usual mix of movie shots, behind the scene snippets, and interviews. We hear from Walt Disney Company vice-chairman Roy Disney, actors John Rhys-Davies, John Goodman, Haley Joel Osment, Jim Cummings, and Mae Whitman, producer Mary Thorne, production color stylist Wes Champion, consulting producer Chris Chase, art director Michael Peraza, background supervisor Beverly McNamara, director Steve Trenbirth, CG animator Ian Richards, lead character animators Ian Harrowell, Kevin Peaty, Kelly Baigent, Simon Ashton, and Myke Sutherland, clean up supervisor Nicola Flynn, and senior vice president for music Matt Walker. The program covers a few different topics. We learn about visuals and backgrounds for Book 2 as well as the new actors and music. Not surprisingly, the tone remains light and fluffy, but a few interesting tidbits emerge along the way. I didn’t learn anything particularly useful about the movie, but it’s always fun to see actors record their voices. I must admit it’s awfully disconcerting to watch Cummings – who looks like an aging Jimmy Buffett fan – do his dead-on Sterling Holloway impersonation, though; that voice and Cummings’ appearance really don’t match! Next we get three music videos. “W-I-L-D” and “Jungle Rhythm” simply offer clips from the movie and include nothing new or noteworthy. “I Wanna Be Like You” by Smashmouth doesn’t seem much better. It shows recording studio shots intercut with film snippets. All three seem eminently skippable. Disney’s Song Selection basically acts as an alternate form of chapter menu. It lets you jump to any of the film’s 10 song performances, and it also allows you to show on-screen lyrics. Sing Along with the Movie expands the latter concept, as it presents the words while you watch the movie. Neither does anything for me, but someone might like them. One cool aspect of “Sing Along” is that the words change colors as the songs progress, which makes it easier for kids to follow along with the lyrics. When you start the DVD, you’ll find the usual complement of advertisements. Here we get commercials for The Lion King, Brother Bear, Piglet’s Big Movie, Stitch: The Movie, and George of the Jungle 2. From the main menu, you’ll discover a Sneak Peeks area that includes all of these promos plus trailers for and Sleeping Beauty, Kim Possible, Air Bud Strikes Back, Recess: Taking the Fifth Grade/All-Growed Down and The Haunted Mansion. Despite its theatrical release, The Jungle Book 2 feels like a direct-to-video product at heart. It provides a fairly flat tale that never threatens to catch fire and turn interesting. The DVD presents good picture and audio quality along with a modest set of supplements. Book 2 might appeal to fans of the original, but it doesn’t seem like anything above average.